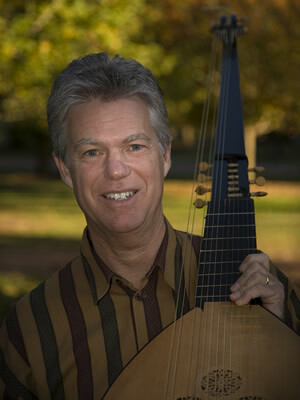 Michael Fields, lute, archlute, chitarrone/theorbo & baroque guitar, is a multi-faceted musician with a world-wide reputation as a performer, director, conductor, teacher and composer. He began his musical journey playing folk, rock and jazz in California and Australia, before a growing interest in early music led him to England to study classical guitar and lute at the Guildhall School of Music and Drama. As a soloist, Michael has given recitals in the USA, Australia and England, and performed and recorded the Vivaldi Lute Concerto. In 2001, he performed Rodrigo’s Concerto de Aranjuez with the Camden Chamber Orchestra in London, to mark the composer’s centenary. Michael has worked as a continuo player in the Consort of Musicke and with New Trinity Baroque in the USA, among other ensembles. His duo with soprano Evelyn Tubb finds admirers worldwide. Critics have praised their “absolute affinity between voice and instrument”, and commented that “Fields’ lute playing accompanied the voice with a precision and harmony rarely found between singer and accompanist.” (L’Arena, Verona). They have recorded many CDs together – including collections of English Ayres, Italian baroque arias by Sigismondo D’India, Lieder with 19th century guitar, and their own arrangements of classical favourites. Their latest release is a CD of medieval song, “The Troubadour and the Nun”. He has also appeared as lute and guitar player on a Van Morrison CD. Michael has been the Musical Director of the Sussex chamber choir, Polyphony, for 20 years, conducting repertoire ranging from Baroque to Contemporary music, including Monteverdi Vespers of 1610, Charpentier Messe de Minuit and Te Deum, Vivaldi Gloria, Rutter Gloria and Feel the Spirit, Mozart C minor Mass. 2006 saw the premiere of his own composition, Midsummer Mass for choir, soloists and orchestra. In 2011 he was appointed as Musical Director of Phoenix Choir, Eastbourne and made his concert debut with them conducting Mozart’s Requiem. The Eastbourne Herald applauded his appointment as “inspired” and the concert as a “magical evening”. His next event with them will be conducting Vivaldi’s Gloria with soloists Evelyn Tubb and Derek Lee Ragin. He directs the vocal ensemble, Vox Animae, whose audio and video recordings of Hildegard’s Ordo Virtutum on BBC Opus Arte have received international acclaim. They have appeared at the York and Brighton Early Music Festivals, at early music festivals in Denmark and Germany, and have broadcast for the BBC and Danish Radio. With his baroque ensemble Sprezzatura, he has recorded a CD of music by Daniel Purcell (Henry’s younger brother), mounted productions of Dido and Aeneas (Purcell), The Beggar’s Opera (John Gay), given the first modern staged performances of Semele (John Eccles - 1707) and has been a guest conductor/director of productions of The Fairy Queen and Acis and Galatea in Riga, Latvia, and of Dido and Aeneas in Belgrade. Michael is the Director of Sastamala Gregoriana, in Finland, acclaimed as the “king of early music festivals” in that country. He has taught masterclasses and courses in early vocal music in Britain, Holland, Finland, Latvia, Poland, Serbia, Czech Republic, Italy and the USA, often in collaboration with the British Council. He has directed Medieval and Baroque music projects at Dartington International Summer School, where he has also taught lute song and madrigal masterclasses. He also teaches classical guitar and lute at Westminster School, London.